Entering a Great Lent - wash our faces not before people but before God and let us experience this personal encounter with Him during this great time. Then, we will see that we step out from this period like Israel from the desert – full of strength, love, awareness that their God as the biggest gift is with them. 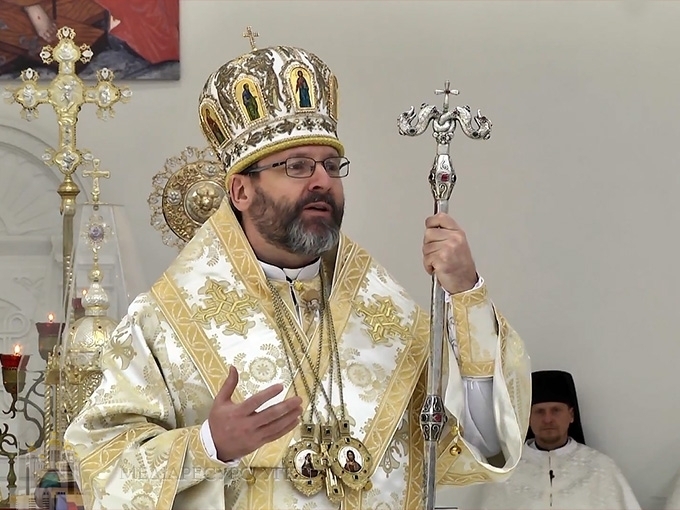 Head and Father of Ukrainian Greek Catholic Church His Beatitude Sviatoslav said during his homily to the faithful on Quinquagesima Sunday, also known as Forgiveness Sunday at the Patriarchal Cathedral of the Resurrection of Christ. This Sunday is special because we mark the beginning of Great Lent with it. In today’s Gospel we see our Savior who delivers His homily amidst desert. He welcomed us to step out and follow Him in this journey because He wants to talk to us, to refresh His love to each of His children – to me and you. Particularly this very second and during this Great Lent. In today’s Gospel, according to the Major Archbishop, we hear about three highly important things, which God tries to communicate to us: forgiveness, face washed with joy and treasure. “Inviting us to this refreshed love relations, before anything else, God wants to grant us His forgiveness. Forgiveness is a moment of renewal and rebirth, after all. Because there is someone who makes the first step to talk to me. His word is a word of love and relief from evil”, said the spiritual leader of Greek Catholics. “Great Lent is a time of desert, the preacher says, when we are trying to avoid commotion of this world with its arrogance and troubles. Great Lent is a time of a prayer, subjugation of the body and its different powers, impulses and needs. It is time of showing mercy on a neighbor, time of good deeds”. Head of Church draws our attention to the fact that while praying, we sometimes think that we are those who talk to God. But, actually, it is God who is an initiator, source of a real prayer is not a man but God, as He moves our hearts, He calls us and asks for giving Him some space and time within our personal. “So, I am asking all of you, during the time of Great Lent to find some more time to talk to God. He has plenty to tell us, including this request to forgive our neighbors”, His Beatitude Sviatoslav encourages. Time of Great Lent is time of subjugating our body, however not for the sake of fighting amidst parts of ourselves, on the contrary, to harmonize who we are, - Head of Church assumes, adding that “Great Lent is also a time of works of mercy. Time when we witness who is a true source of my life and prosperity. When I give alms I show who my heart stays with and who is my real treasure. Forgive each other today and those who trespassed against us, as God wants to forgive us”, His Beatitude Sviatoslav inspired everyone.